The Waupaca Boatride/US Open Grass Volleyball Tournament is a men's and women's grass triples tournament held on the second Saturday of July each year in Oshkosh, Wisconsin. The grass triples tournament has grown into a 4 day volleyball event, with a juniors clinic and other adult and juniors tournaments on the days before and after the main tournament. 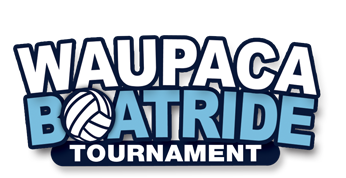 More information on the Waupaca Boatride Volleyball Tournament is shown below. If you have any questions, please don't hesitate to Contact Us. To support Brighton Acres and its fantastic venue, coolers, kegs, and carry-ins will no longer be permissible at the Center Court matches or inside the main building. Brighton will have plenty of staff in the arena to serve your needs. Backpacks are subject to search. Please be respectful of this rule, as we like hosting the tournament at this venue. No pets are allowed on site for the safety of all players and spectators. The registration deadline is July 6, 2018 at 5pm CST. If you signed up and paid but cannot make the tournament, you must let us know prior to the deadline to get a refund. Refunds will not be given after the deadline for any reason.